Have you ever dreamed of riding a bicycle across America? I am Shular Scudamore. My plans for a coast to coast bicycle ride across America started with a "dream" some twenty years ago - wouldn't it be nice to ride a bicycle from the Pacific Ocean to the Atlantic Ocean someday. In a speech delivered in 2008, titled "Dreams to Reality" I talked about three elements that create the foundation of your blueprint to turn your dreams into reality; What you want to be, what you want to do and what you want to have. I used my desire to ride coast to coast as an example of something on my do list. When I was interviewed after the speech, I was asked when I planned to make the ride! I had not attached a date to my ride. It was still a dream and not a goal. Fortunately dreams do not expire. I started May 27, 2012 riding the Adventure Cycling Northern Tier Route, finishing August 8. You can follow my ride for this bicycle tour across America at my blog: Bike Across USA Blog The ride was about 4540 miles. June 16, 1994 I started my ride from Champaign, Illinois to Boston, Massachusetts. The ride was a program of the League of American Biyclists called "Pedal for Power." I did it as a fund raiser for Wayside Cross Ministries in Aurora, IL. 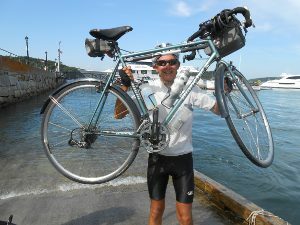 The ride finished at the Atlantic Ocean on July 1. That is the longest ride I had made until my 2012 coast-to coast ride along the Northern Tier. 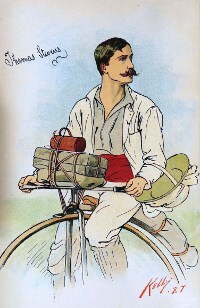 Thomas Stevens wrote of his cycling journey across America in 1884. His book tells of his start in San Francisco on the morning of April 22, 1884. 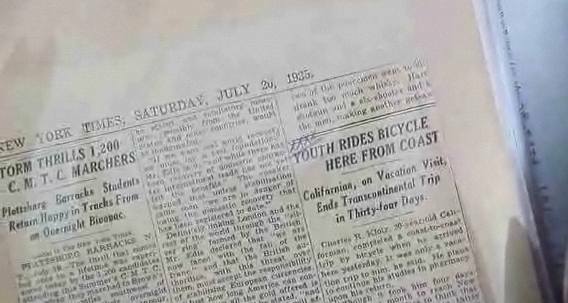 He writes, "Various attempts have been made from time to time, by ambitious cyclers, to wheel across America from ocean to ocean; but - "Around the World!" "The impracticable scheme of a visionary," was the most charitable verdict one could reasonably have expected." Stevens made his ride on a fifty-inch machine. Yes, he rode coast-to-coast on a high wheeler, sometimes called a penny-farthing, this at a time when few roads were paved. George Nellis, Jr. rode a fifty-two-inch Columbia Expert on his seventy-two day journey from Herkimer, New York to San Francisco. He arranged for newspapers to publish letter reports mailed along the way. Biking across the USA east to west, he arrived in San Francisco on August 4, 1887. You can contact me with ideas about routes and suggestions for the trip. "Your dreams are the blueprint of reality"